The terms upper case and lower case actually come from the use of the printing press. Typesetting was done by hand and this could be a long and tiresome project. A type case would be stored in the vicinity of the printing press and held all of the letters used in the typesetting process. Lower case letters were stored in a type case that was kept within easy reach, because these letters were used most often. 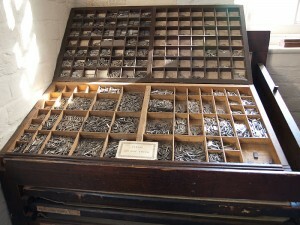 The upper case type case was stored higher up, requiring a longer reach to access the letters. This made sense because this letter case was used far less often. So, as this history lesson goes, upper and lower case does not really have anything to do with the size of the letter itself. It is all about where the type case was stored. Anyone who knows me knows that I am obsessed with typography. Styles and sizes of print can change the entire look of any printing project. I can experiment with type styles for hours, just trying to find exactly the right combination to suit my project. All of you who know me also know that I am not really a history buff. I probably can’t give you a list of important historical dates, but I do know my typography history, and this bit of information is cool. The words struck my artistic chord when I discovered that they painted a picture, and didn’t just describe size. So many words in our language are derived from unusual places and it is an interesting adventure looking for that origin.